Clase Arleigh Burke é un tipo de destrutor norteamericano da Armada dos Estados Unidos de América é o deseño no que se basean as F-100 da Armada Española. Foi a primeira serie de buques construídos para o sistema de combate AEGIS. Radar AN/SPY-1 e integrador de sistemas de combate por Lockheed Martin. ↑ Analyst: DDGs without CIWS vulnerable. Navy Times. 16 September 2008. 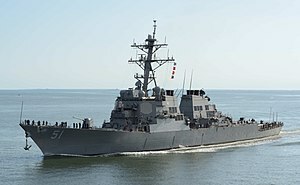 ↑ "Future USS John Finn (DDG 113) Launched". US Naval Sea Systems Command (NAVSEA). 30 March 2015. Arquivado dende o orixinal o 2 April 2015. ↑ "Future USS Ralph Johnson to be Commissioned in Charleston" (Nota de prensa). U.S. Navy. 23 October 2017. NNS171023-23. Consultado o 31 October 2017. ↑ "Ingalls Shipbuilding Authenticates the Keel on Aegis Destroyer Ralph Johnson (DDG 114)". Huntington Ingalls Industries news release. 23 September 2014. Consultado o 3 December 2014. ↑ Allvord, Chase, LTJG (9 November 2015). "Rafael Peralta Achieves Three Key Milestones in One Weekend". US Navy. Consultado o 6 October 2017. ↑ Garske, Monica; Tatro, Samantha (29 July 2017). "USS Rafael Peralta Commissioned in San Diego". KNSD. Consultado o 29 July 2017. ↑ "USS Thomas Hudner" (en inglés). Consultado o 2017-03-30. ↑ This story was written Naval Sea Systems Command Public Affairs. "Future USS Paul Ignatius Begins Fabrication". Consultado o 27 October 2015. ↑ This story was written Team Ships Public Affairs. "Fabrication Begins for the Future USS Daniel Inouye". Consultado o 27 October 2015. ↑ "U.S. Navy Launches the Future USS Delbert D. Black". US Navy. 11 September 2017. Consultado o 6 October 2017. ↑ LaGrone, Sam (13 March 2015). "SECNAV Mabus Names Destroyer After First MCPON Delbert D. Black". USNI News. Consultado o 6 October 2017. ↑ 12,0 12,1 "Navy Awards General Dynamics Bath Iron Works $644 Million for Construction of DDG 51 Class Destroyer". General Dynamics. ↑ Huntington Ingalls Industries. "Ingalls Shipbuilding Awarded $618 Million Contract to Build DDG 123". Huntington Ingalls Newsroom. ↑ "Secretary Mabus Names Newest Arleigh-Burke Class Destroyer". US Navy. 9 November 2016. Consultado o 6 October 2017. ↑ "Keel Laid for Future USS Frank E. Petersen Jr.". US Navy. 21 February 2017. Consultado o 6 October 2017. ↑ "US Navy to name next destroyer after Medal of Honor recipient John Basilone". Naval Today. ↑ Otto Kreisher. "Mabus Names Arleigh Burke Destroyer After Higbee, First Woman Awarded Navy Cross". ↑ "Photo Release-Huntington Ingalls Industries Authenticates Keel of Guided Missile Destroyer Lenah H. Sutcliffe Higbee (DDG 123)". Huntington Ingalls Industries. Consultado o 14 December 2017. ↑ 19,0 19,1 "Notice to Congress on 8 Proposed Navy Ship Names". USNI News. 2016-08-03. Consultado o 2016-08-03. ↑ "Bath Iron Works Awarded First Flight III Destroyer Two Ship Contract Modification". usni.org. 2017-09-28. Consultado o 2017-11-27. A última edición desta páxina foi o 20 de febreiro de 2019 ás 17:04.